The 41.7 metre motor yacht Lucky Me has been jointly listed for sale by Charles Ehrardt at Camper & Nicholsons International and Marine Marketing. 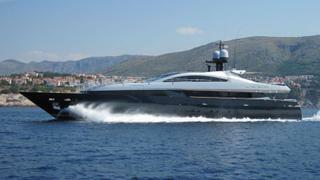 Designed inside and out by Francesco Paszkowski, Lucky Me was built in aluminium by Italian yard Baglietto to ABS class and MCA coded with delivery in 2010. Accommodation is for up to 11 guests in five cabins featuring a full beam master suite on the main deck with a private study and double sea balconies. Below are two VIP suites and two doubles and all cabins have entertainment centres, LCD television screens and en suite bathroom facilities. In addition, there is accommodation for seven crew in four cabins aboard this yacht for sale. The main deck saloon is voluminous with allowance for ample comfortable seating and a small bar, and is separated from the dining room with formal dining for 12 guests by a retractable widescreen television set which can be concealed to create a stunning open plan area encouraging guest circulation and conversation. This would also be an ideal space for cocktail gatherings or dancing. The wide aft deck is arranged as a generous family seating area for al fresco entertainment and meals, while an integrated staircase to starboard leads up to the upper deck where guests are greeted by a small bar with a retractable television screen and a dining table with seating for 10 to12. Twin 3,700hp MTU diesel engines give her a cruising speed of 21 knots and a maximum speed of 27 knots. Lying in Italy, Lucky Me is asking €9,900,000.